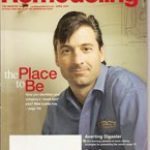 For the 21st consecutive year, the REMODELING editors searched the country for 50 companies that exemplify best practices in business systems, customer service, workmanship, and support of their employees, communities, and the profession as a whole. Measured against their highest-quality competitors, these innovative and dynamic companies stand out as the best in the business and models for the industry as a whole. Join us in saluting the Big 50 class of 2007. Glen Lumia (back row, center) knows his market by ZIP code, home and project type, client profession, and other details. Any way you slice it, the Creative Design Construction and Remodeling owner knows to whom he’s selling, how to wow them, and how to maximize profits. “We like to know who our clients are, what they want, where they live, and why they are buying from us,” says Lumia, who admits to starting slow in the business — “I didn’t even understand markup and margin,” he notes — nearly two decades ago before he got serious. Every employee has an individual education budget and works toward written goals. Lumia says he wants to give his employees a “road map and a destination.” His vision is to have an employee-vested company with stable growth and stable earnings so “we can be the leading design/build company in our target market.” —S.F.